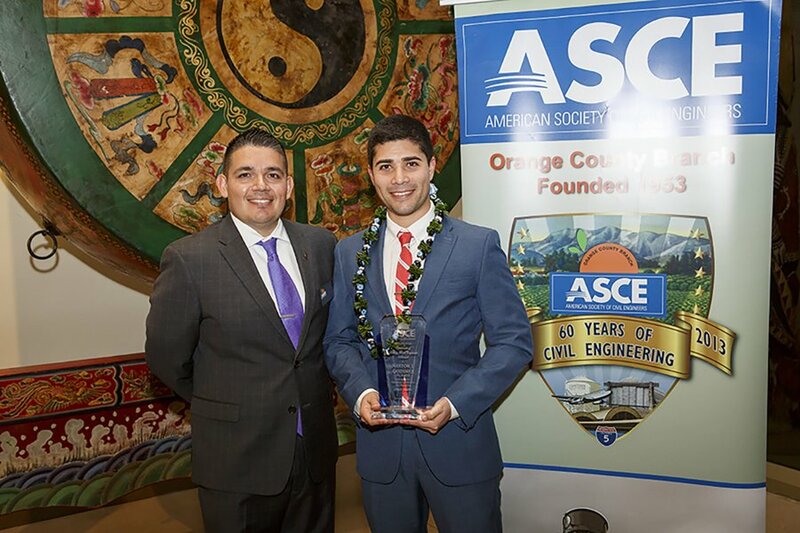 On February 15, SLR’s Project Engineer Nestor Godinez received the 2018 Outstanding Younger Civil Engineer Award at the American Society of Civil Engineers (ASCE) Awards Dinner. The annual event was held at the Bowers Museum in Santa Ana, California and recognizes a few of Orange County’s finest Civil Engineers and projects. Nestor was recognized for his 10 years of national and international engineering experience in civil, site remediation, and mining projects, as well as his ASCE and civic contributions. Nestor is in his sixth year serving on the ASCE Board for the Orange County Younger Member Forum (OC YMF) and is currently the Past-President acting in an advisory role to the current Executive Board and lead of the Awards and Recognition Program recognizing YMF members for their contributions. While serving as President of OC YMF in 2016-2017, Nestor increased the growth of the YMF Board, relaunched the PE Review Course, and increased collaboration with the Branch Board. A few of his civic contributions include Ronald McDonald House Cook-A-Meal for families and ASCE YMF K-12 Outreach, Community Service and Jog-A-Thon events. Currently, Nestor has most recently been involved with water balance modelling for mining projects. Before working for SLR, Godinez received his master’s degree in civil engineering from California State University, Fullerton in 2009. 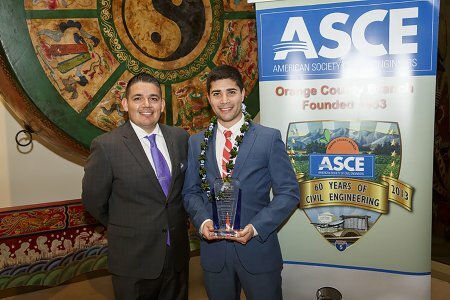 He was also the recipient of the ASCE OC YMF President’s Award in 2014. Nestor Godinez with ASCE Orange County Branch 2017-18 Past-President Josue Vaglienty .